In broad terms, voters view the Democratic Party’s ideology as the opposite of the Republican Party’s: 58% say the Democratic Party is either very liberal or liberal while 56% say the GOP is either very conservative or conservative. However, more voters view the Democratic Party as very liberal than see the Republican Party as very conservative (26% vs. 18%). As a result, the average rating for the Democratic Party’s ideology among all voters is somewhat farther to the left than the Republican Party’s is to the right. The Republican Party’s rating also is closer to voters’ average ratings of their own ideology, which is slightly to the right of center. The national survey by the Pew Research Center for the People & the Press, conducted June 16-20 among 1,802 adults (1,496 registered voters) reached on cell phones and landlines, finds that the Tea Party movement is viewed as conservative, though not extremely conservative. 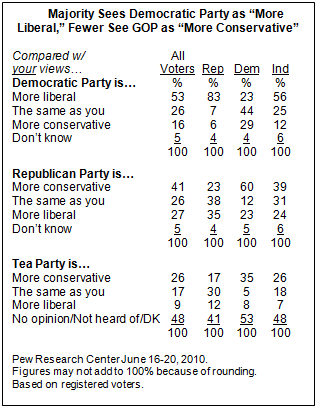 One-in-five voters (20%) say the Tea Party is very conservative while about as many (21%) see it as conservative. Nearly half of voters (48%) had no opinion of the Tea Party’s ideology or had never heard of the movement. In assessing their own political views, 40% of voters describe their own political views as conservative (either conservative or very conservative), 36% as moderate, and 22% as liberal (including very liberal). There are substantial differences in the way that Republican and Democratic voters describe their political views. Fully 65% of Republican voters describe their views as conservative (18% very conservative, 47% conservative), compared with 29% who say their views as moderate and just 5% who say they are liberal. Democratic and independent voters are more diverse ideologically: 42% of Democrats say they are liberal (including 10% very liberal), 32% are moderate and 24% are conservative. Among independents, 48% describe their views as moderate while 33% say they are conservative and 17% are liberal. The survey makes it possible to compare voters’ own views with their assessments of the parties’ ideologies. About half of all voters (53%) view the Democratic Party’s ideology as more liberal than their own. A smaller percentage (41%) says the Republican Party’ ideology is more conservative than their own ideology. An overwhelming proportion of Republican voters (83%) see the Democratic Party’s views as more liberal than their own political views. 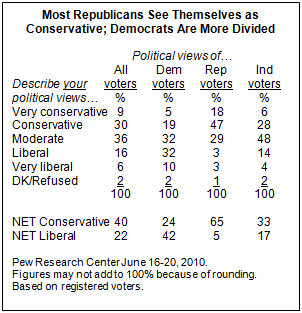 By contrast, far fewer Democratic voters (60%) say the GOP is more conservative than they are. Among independent voters, 56% say the Democratic Party is more liberal than they are; just 39% find the GOP to be more conservative than they are. Many Republican voters place themselves ideologically to the right of their own party. More than a third (35%) says the GOP is more liberal than they are; that is about the same percentage (38%) that says the Republican Party’s ideology is the same as theirs. Fewer Republican voters (23%) say the party is more conservative than they are. Among Democratic voters, 44% say their party’s ideology is the same as their own, while 29% see the Democratic Party as more conservative than they are; 23% see the party as more liberal. 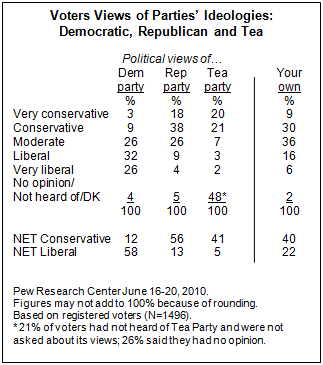 Nearly half of all voters (48%) either never have heard of the Tea Party or express no opinion of its ideology. Among voters expressing an opinion, 26% say it is more conservative than they are, 17% say its views are the same as theirs and 9% see it as more liberal. 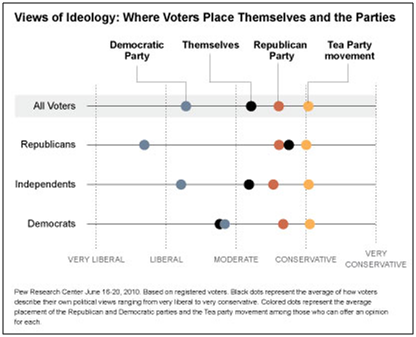 Three-in-ten Republican voters place the Tea Party at the same point as themselves ideologically; 17% say it is more conservative while nearly as many (12%) see the Tea Party’s views as more liberal than their own.